Click on Create Alert in the menu-bar. Click Preview before sending you manual alert to view the recipients (both Groups and Users), that will be receiving the alert. You can remove any user’s contact method here, so if you don’t want the Manager’s phone to ring you can uncheck their phone contact. Add a Topic to a manual alert to quickly and accurately select recipient Groups and a Message Text associated with the Topic. This example shows a Topic that selects Groups and loads a Message Text associated with the Topic. 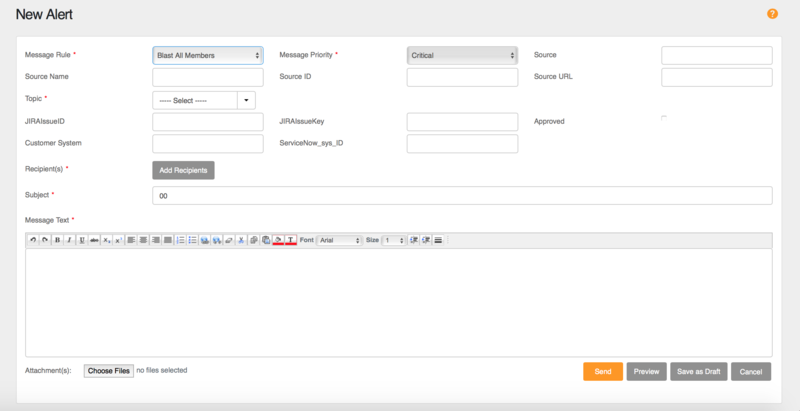 Assign User or Group recipients using the Email API.